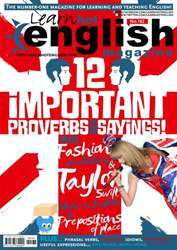 Digital Subscriptions > Learn Hot English > Hot English 162 > HOW TO LEARN DIFFICULT WORDS IN ENGLISH! Some words are easier to learn than others. For example, there are thousands of cognates in English, such as the word “education”, which is almost identical in French (“éducation”) and Spanish (“educación”). In other cases, you can guess the meaning of words through the context. However, some words are just really hard to learn as they just don’t seem to have any relation to any other words you know. So, what can you do?